Takuya Maeda was reading about the argument for reparations for African Americans — the idea that some form of compensation be awarded the descendants of the Atlantic Slave Trade — when he stumbled across an interesting fact. The United States, he read, had apologized for incarcerating Japanese Americans during World War II and authorized payments of $20,000 to each surviving internee as part of the Civil Liberties Act of 1988. Maeda, whose family moved to suburban New York City from his native Japan in 2001, had been vaguely aware of the redress. The total reparations reached about $1.6 billion by the time the federal government closed the books after a decade. 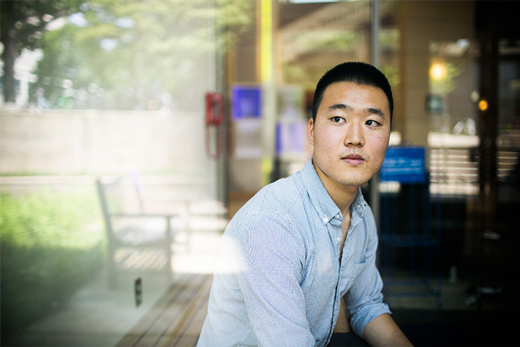 But the history major wondered whatever became of the relatively small $5 million trust fund set aside for the Japanese-American community to develop educational efforts and awareness about internment. The research would seem straightforward in the Google era. But Emory College history professor Daniel LaChance, who mentored Maeda through the process, said hurdles began popping up almost immediately. There is no online database of projects funded with the trust. Maeda’s request to review files at the Japanese-American National Museum in Los Angeles was declined. Without such original source material, the project would have stopped. But Maeda proved a tenacious and zealous researcher, finding Dale Minami, chair of the committee that oversaw the trust, in San Francisco. An attorney, Minami had kept boxes of files from his committee work. And he agreed to let Maeda dig into all of it: notes, letters and project requests. Maeda used his funds as one of 14 grantees in the Scholarly Inquiry and Research at Emory (SIRE) program to travel to the West Coast for the digging. “Takuya was looking at original source material that no other historian had seen. It was truly groundbreaking,” LaChance says. Maeda entered his research expecting a continuation of the political whitewashing that was part of getting the reparations awarded. The legislation frames Japanese-Americans as something of a deserving minority, focusing exclusively on the 26,000 would-be interned people who served in the U.S. armed forces after being drafted or volunteering to serve while their families remained incarcerated in the camps. Ignored were stories of the internees who protested their loss of liberty and property and those who refused to comply with the draft. “I really think the legislation and education fund were in some ways the best option that was possible in the social and political climate of the times,” Maeda says of the Reagan era. The surprises included the documents showing the community leaders who directed the trust fund stated outright that they wanted to tell more of those silent narratives missing from the official history. They also wanted to build bridges with other minority groups, in a bid to both share the lessons they had learned in the pursuit of redress and to honor the inspiration the broader civil rights movement had on their campaign. Clearly, there were hiccups along the way that prevented the lofty goals. Planned partnerships failed to materialize, sometimes due to simple miscommunication. Maeda uncovered one project, from an educator from the University of Massachusetts, which would have started to bridge the gap between Japanese-Americans and other marginalized groups. A review panel rejected the idea, which was to develop a curriculum that showed parallels between the internments and modern immigrant isolations and vulnerabilities, without comment. Minami’s board eventually approved the project after a lengthy appeal, Maeda found. “Internment has been such a central part of the identity of Japanese Americans, but the board recognized that the existing depictions of this history did not do justice to the diversity of experiences and perspectives within the community,” Maeda says. “Recovering these stories gives us a better understanding about the contemporary implications of internment, the long history of activism within the Japanese-American community and allows the lessons that we as a nation must learn from internment to reach a broader audience," he explains. In addition to the important new findings, LaChance notes that the research highlights a lesson for historians in general. The evidence shows that it was not always ideology that drove the grant-making process, but sometimes communication breakdowns. “He was driven in his examination to answer not just what had happened but how it had happened,” says LaChance, adding he expects Maeda’s findings to be published. Having a paper based on his original research would help Maeda achieve his eventual goal of earning a doctorate in history. He plans to spend the coming year studying Japanese, to improve his language ability. Then he wants to pursue more research, looking at the trans-national dimension of Japanese-American history.